Miami football doesn’t have a long history like a Michigan or Notre Dame, but since 1980 there have been few programs that have won as much and produced as much talent as the Hurricanes. Trying to whittle down the Hurricanes’ football history to four people was a nearly impossible task, as so many incredibly talented players have come through Coral Gables on their way to football stardom. The notable snubs include Bennie Blades, Vinny Testaverde, Bernie Kosar, Willis McGahee, Jonathan Vilma, Sean Taylor, Ray Lewis and many more. In the end, these are the four names we landed on, three players and one coach that represent Miami football as much if not more than any others. Howard Schnellenberger (1979-1983): Schnellenberger was only the coach at Miami for five years, but he laid the foundation for the dynasty of the 80s. Prior to Schnellenberger’s arrival, the Hurricanes had not won seven games in a season in over a decade. He accomplished that feat four times and led Miami to its first national championship in 1983. Jimmy Johnson has the most title and is more famous — in part because of his NFL coaching career in Dallas — but the foundation for those titles in 1987 and 1989 was the culture that Schnellenberger created in Coral Gables. Ed Reed (1998-2001): The 2001 Miami Hurricanes were arguably the greatest team in college football history and Reed was the vocal and emotional leader of that group, as well as being a dominant force in the secondary. Reed recorded 21 career interceptions, returning four for touchdowns, while at Miami and went on to being one of the greatest safeties in NFL history. The 2001 team was stacked with incredible talent, but the heart and soul was Ed Reed — and he was also arguably the best player on a loaded squad. To pick one representative from that team is almost unfair, but the clear choice is Reed. You can argue for any of the four to go in this slot and make a compelling case, but in thinking about Miami football image, as much as anywhere, matters and Kelly is synonymous with Miami football at that time. Like Schnellenberger, he was the first to do it and laid the foundation for guys later that accumulated greater stats and accolades, but when you think of a Miami coach it’s Schnellenberger and when you think of a Miami quarterback it’s Jim Kelly. Michael Irvin (1985-1987): No player better exemplifies the attitude of the late 80s Hurricanes quite like Michael Irvin. He is the personification of the swagger that that defined those teams and he put up big numbers that helped the Hurricanes capture their second national championship in 1987. Irvin is still the career leader at Miami in touchdown receptions with 26 and he also compiled over 2,400 receiving yards in his three seasons with the Hurricanes, but what set him apart from the other incredible players from Miami was how there are few players that I feel are more “Miami” than him. 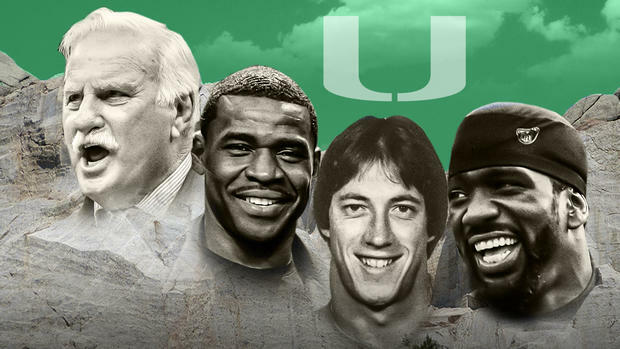 For a Mount Rushmore, which is the faces of a program, few faces are more synonymous with Miami football than Michael Irvin.